The man who coined the term humanism - umanesimo - Ludovico Ariosto, was born on this day in 1474 in Reggio Emilia. He became famous after his epic poem, Orlando furioso, was published in 1516. It is now regarded by critics as the finest expression of the literary tendencies and spiritual attitudes of the Italian Renaissance. Ariosto chose to focus on the strengths and potential of humanity, rather than upon its role as subordinate to God, which led to the Renaissance humanism movement. 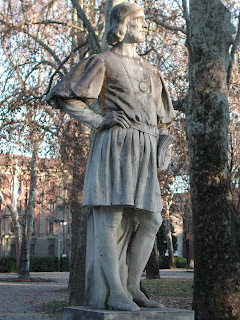 His family moved to live in Ferrara when he was just ten years old and the poet has said he always felt ferrarese. His father insisted he studied law but afterwards Ariosto followed his natural instincts to write poetry. When his father died in 1500, Ariosto had to provide for his four brothers and five sisters and took the post of commander of the Citadel of Canossa at the invitation of Ercole I d'Este. Then, in 1503, he entered the service of Cardinal Ippolito d’Este, son of Ercole I. He was obliged to follow the Cardinal on diplomatic, and sometimes dangerous, missions and expeditions. From about 1505 onwards, Ariosto was working on Orlando furioso and he continued to revise and refine it for his entire life. 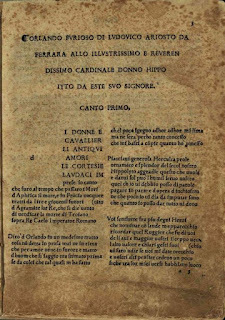 The first edition was published in Venice in 1516 and the second in Ferrara in 1521. Both were written in the ottavo rima form, eight line stanzas, in the tradition of Boccacio. The poem follows the fortune of its hero, Orlando, who goes mad out of unrequited love against the backdrop of war between Christians and Saracens. 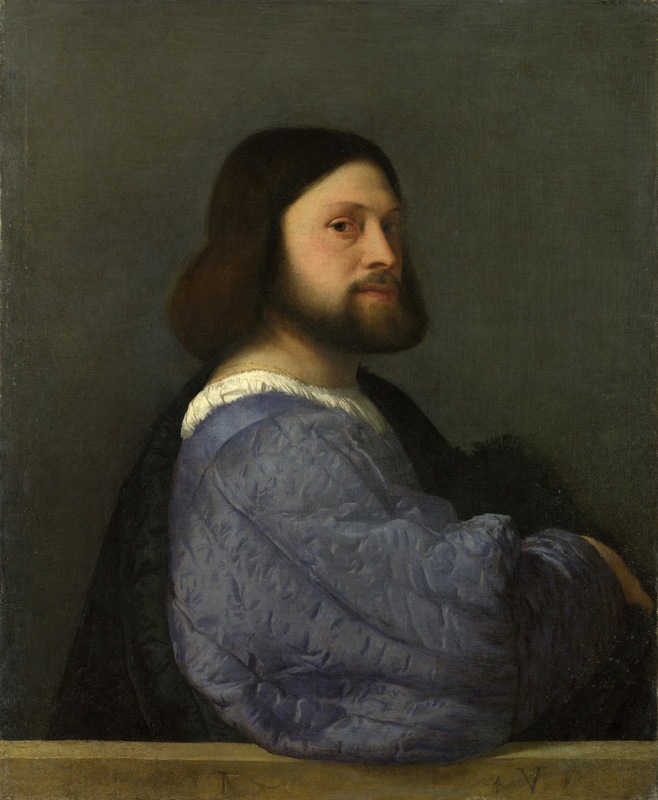 Ariosto’s own refined spirituality is said to come through in his characters. Orlando furioso instantly became popular and profoundly influenced the literature of the Renaissance. 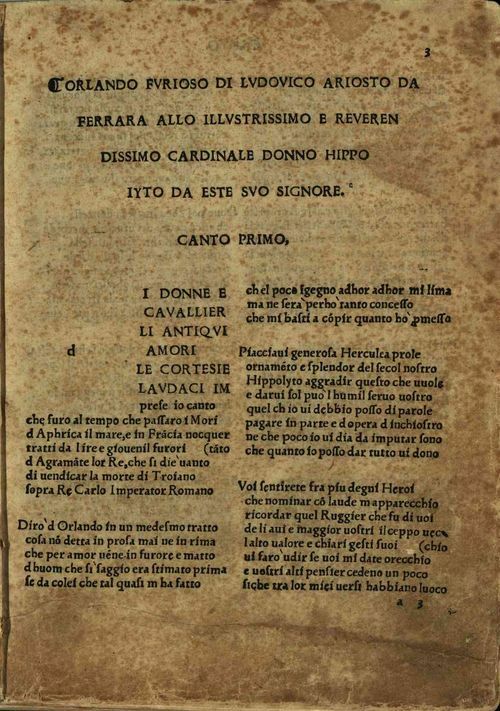 Ariosto went on to compose seven satires and five comedies, while he was having to serve as governor of the Garfagnana, a wild province in the Apennines, out of financial necessity. But by 1525 he had saved enough money to return to Ferrara, where he secretly married his mistress, Alessandra Benucci, and bought a house with a garden to settle down in. He produced a third edition of Orlando furioso, which was published a few months before his death in 1533, and he wrote an appendix to it that was published posthumously. Reggio Emilia is an ancient walled city in the region of Emilia-Romagna. 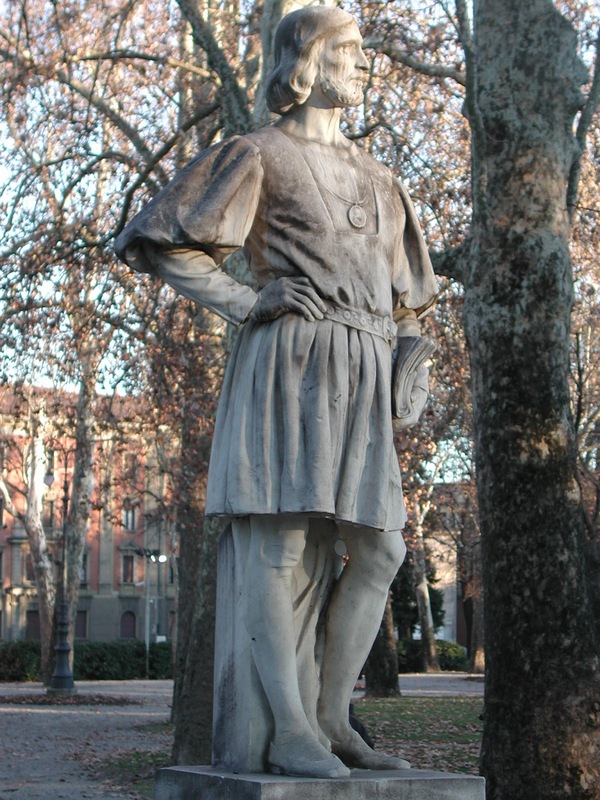 There is a statue of Ariosto and you can see the villa he was born in, near the municipal building in the centre. You can also see a villa outside the town, Il Mauriziano, where he spent time while he was governing the city on behalf of the Dukes of Ferrara. Ferrara, where Ariosto lived for most of his life, is a city in Emilia-Romagna, about 50 kilometres to the north east of Bologna, which has many palaces dating from the 14th and 15th centuries, when it hosted the court of the House of Este. Dominating the centre is the magnificent Castello Estense, where Lucrezia Borgia lived after her marriage to Alfonso I d’Este. The moated, brick-built castle is open to the public every day from 9.30 till 5.30 pm, apart from certain times of the year when it is closed on Mondays. For more details and ticket prices visit www.castelloestense.it.